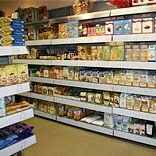 Products inside the store should be easy to locate, be near related products, and have the correct facings; Space management is about maximizing every inch of the selling floor. Once the inventory comes inside a retail store, the next big thing which comes inside the mind of a retailer is to decide where to put it and how much area should be allocated to the specific product. The decision of where in the store the products will sit is very important step in retail since store layouts are crucial to the shopping experience. Products need to be easy to locate, be near related products, and have the correct facings. Space management is about maximizing every inch of the selling floor. A literal meaning of sales display is - arranging systematically saleable goods so as to attract the attention of the customer. In retail industry, product visibility of any brand is necessary to promote sales. Many a times, space is often limited and merchandise to be displayed is more, so one needs to really manage the space well - herein comes shelf management. Kalro says, “Shelf management plays an important role in managing merchandise well and helps to focus on categories or products that retailer intends to promote. Many brands and retailers try to engage the customer at the point of sale. Product promotion inside the store is very important to make consumers aware of sales promotion schemes as advertising in mass media is expensive and deliveries are not 100 percent. Today brands and retailers are cutting down on expenditure in mass media and focusing on the customer contact point. This is going to become more pronounced as the modern retail grows in India.